On November 16, we're hosting the w(HERE) gathering featuring Portland painter, illustrator, educator and muralist Alex Chiu. Join us to hear Alex talk about & share images of his work, specifically the work he's doing in the community. 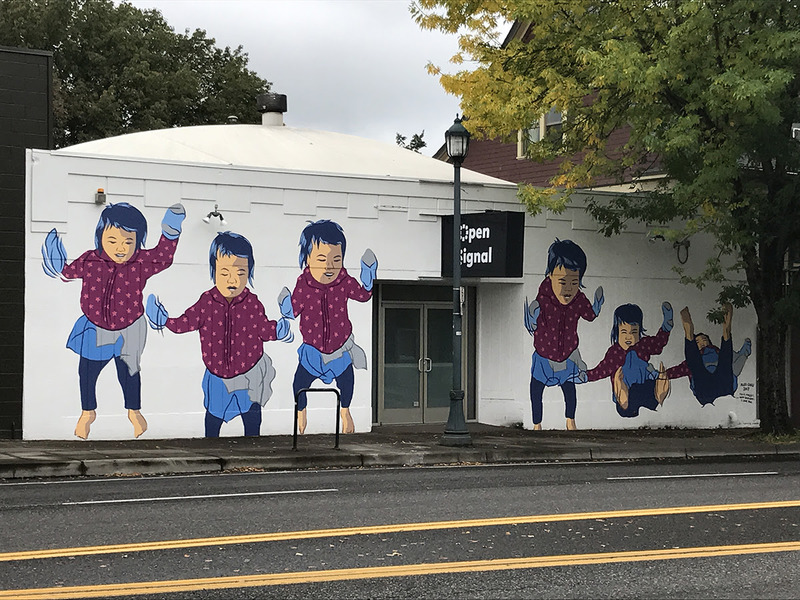 He has recently finished a public mural project for the Trimet MAX station on NE 82nd Ave. His recent projects have shifted towards exploring a documenting the stories and images of marginalized people in Portland. He is also slated to have a solo art exhibit to the P:ear Gallery in June, 2018. My name is Alex Chiu. I’m a painter, illustrator, and art teacher living in Portland. I’m also a stay at home dad. I have a 3 year old daughter named Mazzy. 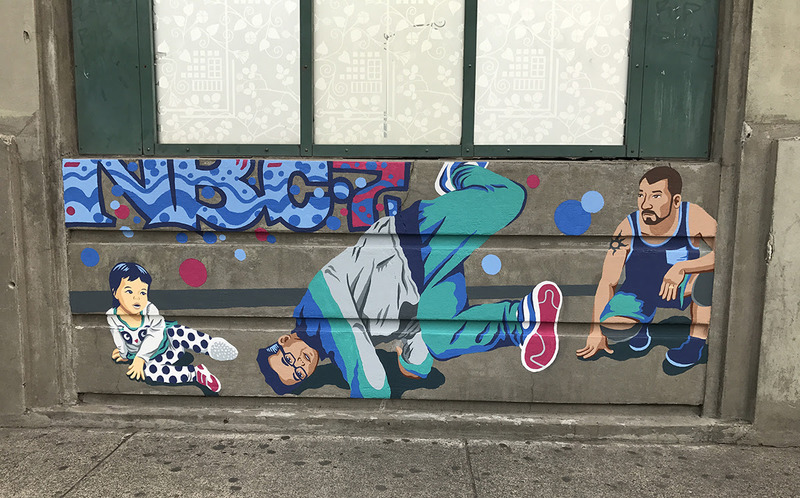 Recently, I have painted a couple of public murals in the area. I am hoping that I will have more opportunities to do public murals in the future. I really love your personal statement on your website from 2010. What has changed since then and what has stayed the same? At the time that I wrote that statement, my goal was to live simply and make as much art as possible. I had just gotten married and was determined to make a living off of my artwork in the Los Angeles area. In retrospect, I do think I was able to achieve the goals that I had aspired towards. I am currently still an artist. Our lives have been full of creative and joyous experiences. We’ve met good friends and inspiring people along the way. We now have a daughter and are able to introduce her to a unique lifestyle that I was never exposed to as a child. I hope she can learn from and appreciate these experiences. Yes, some things have changed over the last several years. I’ve now lived in Portland since 2012. Moving here was a big change and forced us to find work and new friends. Also, having a child was life changing. We’ve managed well in terms of basic survival. I do not see myself as the same carefree individual I was in 2010, although I appreciate my own idealism and still believe that art is a wonderful way to escape and inspire others to create a better world. How would you describe your style? How has it evolved over the years? I still consider myself to be a cartoonist. To me, that means that I can simplify the world into universal symbols and patterns. I usually draw and paint without a ton of planning or sketching. I enjoy surprising myself and not knowing how something will end up looking. The way that I am currently making art is not as intuitive. The newest murals that I have painted are renderings created directly from reference photos. The process is much more controlled and calculated. To be honest, this transition is very new and feels a bit unnatural. I believe that I am challenging myself to focus on technique and get better at craftsmanship. I hope to balance both creative processes in my future work. Out of all the murals you’ve created, which one is your favorite? Why? I am very proud of the series of paintings that I created for the Trimet mural project. I am happy to have incorporated several different people that I know and respect into the mural making process. All of the images that I painted originated from photos that I took. I enjoy how this project felt more like documentary than painting. I hope to be able to work this way for future projects as well. Who would you consider influential to your work? Recently I’ve been inspired by a local artist who goes by Eatcho. His artwork exhibits mastery of technical skill and creativity. I am also drawn to the comics of Amy Kuttab, particularly her incorporation of animated movement in her illustrations. My daughter has been a pleasure to have around. She has definitely influenced how I think and feel about art making. I have incorporated her as a subject in much of my recent artwork. Lately I have been thinking a lot about race. As an Asian-American, race is definitely an issue that affects my life, but it is hard for me to articulate my feelings about my own racial identity. The recent political climate has affected me deeply. I am bothered by the anti-immigrant/anti-black sentiments that have become more apparent. I currently think about these things more. I think about how these things will affect my daughter and family in the future. I am currently interested in representing images and telling stories of marginalized people in Portland. I believe that artwork is a powerful tool that can be used to tell stories that need to be heard and bring attention to people who aren’t seen. I hope to be able to do this for the unseen and unheard. I am currently interested in learning about and building relationships with various people on the margins of society. This may include people of color, the elderly, the disabled, the impoverished, etc. What can we expect from the w(HERE) gathering? I do intend to create a slideshow of my recent public mural projects and artwork. I will talk about my creative process and answer any questions that people have for me. I am honored to be able to process and talk about the work that I have recently created. I hope to have more opportunities to do public murals in the future. Next summer, I have a solo art exhibit at P:ear Gallery in Downtown Portland. I hope to develop a body of work that pushes my work into a more socially focused direction.